We have plenty of Trek rental bikes and shuttles available. Reservations are not really necessary unless you are bringing 10 or more of your friends. Reservations are needed if you are joining us for a specialty trip or planning a multi-day adventure. We want to make it as easy as possible for you, so just show up at your convenience. If you would like to book now anyway, we will certainly accept your reservation up to a day before the trip date. Day of trip bikes and shuttle seats are given away on a first come first serve basis. 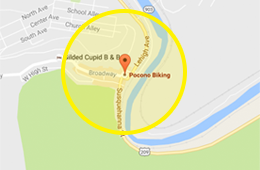 For your convenience, we have two Pocono Biking locations that rent bikes and run shuttles. Don’t forget to check the locations page to confirm hours and other important information. 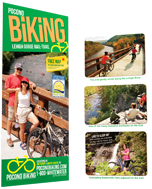 If you have any questions or just want to chat with us about Pocono Biking or the Lehigh Gorge Rail Trail, simply give us a call at 570.325.3654, LiveChat us or send an email to Info@PoconoBiking.com. Big Day Out: Reservations can be made online here. Cancellations made more than 10 days prior to a trip may be rescheduled or refunded. If you cancel within 10 days of your trip, we would be happy to reschedule or send activity vouchers.